Are you ready to spice up your diet with antioxidant-rich foods that can ward off wrinkles? My name is James Christian Sardelli, RPA-C, and I turn back the hands of time using injectables for my clients in the NYC and Long Island, New York areas. I also enjoy publishing information on anti-aging. So…start making your shopping list! It’s time to eat your way to a younger-looking you. Helps block cell destruction from free radicals, keeps the thyroid functioning optimally, and keeps skin and other body tissues healthy. What to eat: Brazil nuts, mixed nuts, Pacific oysters, liver. This mineral helps the body to regulate a variety of important functions and builds bone. As women age, we lose bone mass due to lower levels of estrogen. What to eat: sardines with bones, leafy greens, tofu with added calcium, dairy products such as milk, cheese, and yogurt. These compounds reduce inflammation in the body and free-radical damage. What to eat: dark chocolate, onions, green tea, red wine, citrus. These compounds help keep your arteries flexible and elastic to optimize blood supply (i.e. nutrients and oxygen) to the skin and other tissues. What to eat: dark chocolate, flaxseed (ground), cloves, star anise, Mexican oregano, celery seed. This super vitamin helps to prevent free-radical damage that can occur from exposure to the sun, environmental pollution, and not-so-good lifestyle choices. What to eat: blueberries, papaya, yellow bell pepper, mango, kiwi fruit, strawberries. Omega-3’s have excellent anti-inflammatory properties. These “good fats” help keep cell-damaging inflammation at bay throughout the body, including in the skin. What to eat: Atlantic mackerel, walnuts, Alaskan salmon, chia seeds, flaxseeds. In order for certain antioxidants to do their job properly in the body, manganese is required. This substance is also linked to the creation of an enzyme that helps build bone. What to eat: mussels, clams, hazelnuts, pumpkin seeds, whole wheat bread. This protein fiber is found in just about every tissue of the body, including the skin, muscles, and bones. 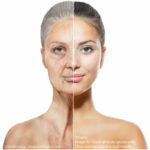 As we age, collagen production slows down, and existing collagen can become more brittle. This can result in loose skin that also wrinkles more easily. What to eat: pomegranate, red bell pepper, broccoli, pink grapefruit, tomatoes (cooked), salmon, carrots. This vitamin is not only crucial in helping preserve vision, but also plays an important role in the development of collagen in the skin and joints. What to eat: beef liver, carrots, sweet potato, kale, spinach, egg yolks. This brightly colored spice helps to prevent shortening of telomeres in our DNA. As we age, these telomeres get shorter, causing aging of the cells in our body. Turmeric helps halt this shortening from occurring, resulting in less cell damage to our skin. What to eat: turmeric root (fresh) or powdered. If taking a supplement, be sure it contains black pepper extract for maximum absorption by the body. James Christian Sardelli, RPA-C is the founder of James Christian Cosmetics located in Suffolk County, Long Island, Manhattan, Islip, Westhampton Beach, Commack, Rockville Centre, Farmingdale, West Sayville, and Huntington, New York. For a free consultation or to schedule your first treatment, call (917) 860-3113. *The information on this page is not intended to be used as medical or nutritional advice in any way. Always consult with your doctor for any health related concerns and before starting a new diet or exercise program.